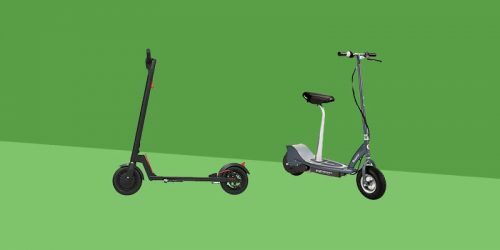 If you’re looking for a complete pro scooter rather than mixing and matching parts for your own, then a Lucky Pro Scooter is one of the best options available to you right now. In our list of the 11 Best Pro Scooters, two of them were Lucky Scooters. 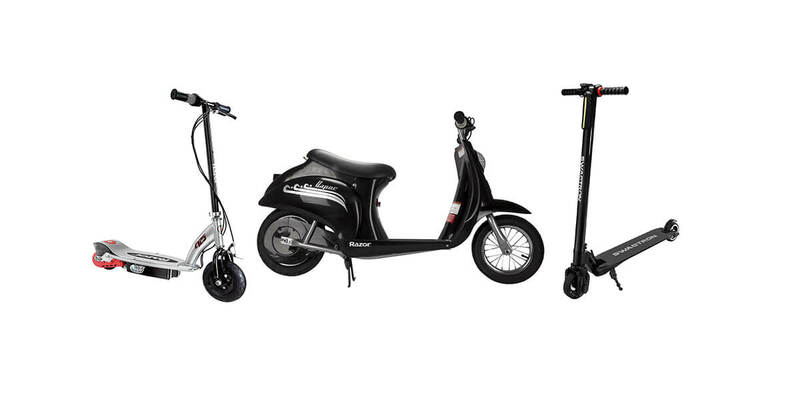 In this post we’ve gone one step further and reviewed our favorite 5 Lucky Pro Scooters. We’ll go through what we like and dislike about each one and then what we think is worth you spending your money on for different situations. All these scooters are complete, so there is no need to have to research customizing them or look at any pro scooter parts. They are all (almost) ready to go, straight out of the box so you can be riding in no time. The first Lucky Pro Scooter we’ll look at is the Lucky Covenant. This is the most expensive of all the Lucky Scooters we’ll be looking at today and we think is the all round best. This complete pro scooter is a lightweight, versatile scooter for riders striving to excel in all areas of riding. It’s built to withstand some serious abuse, feeling strong and sturdy. The Covenant features super fast and smooth 110mm Toaster wheels with a set of newly designed Silo bars, and a 120mm compatible Indy fork made from aircraft grade aluminum. 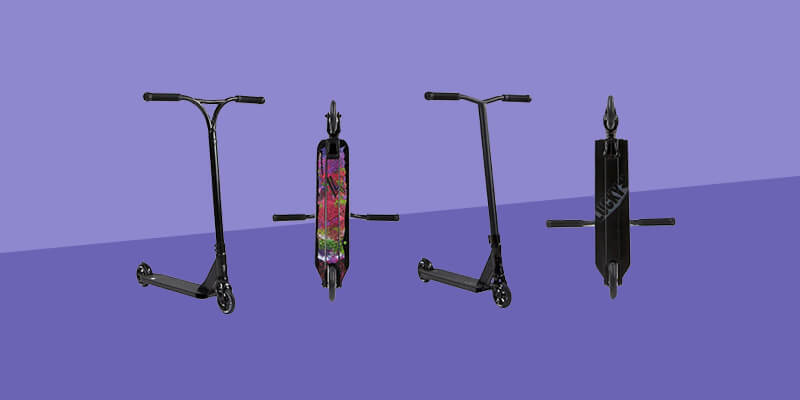 The Lucky Covenant also comes in a range of styles that we think are some of the best looking trick scooters you can buy, not just for Lucky Scooters but in general. The different styles behind the Covenant’s deck styles are created by Shogo Ota, who has previously worked with companies such as Red Bull and Starbucks to create some very unique and eye catching art. 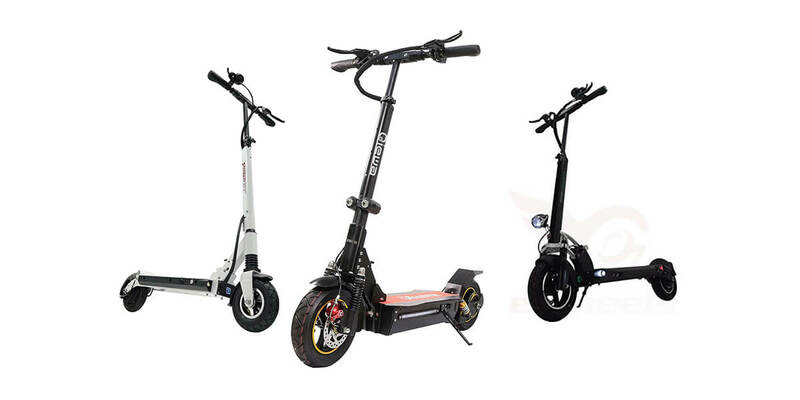 There are 4 different versions for the latest style of scooter, all with their own individual and vibrant look and feel. The only real downside to the styling is that we just wish this scooter had less chrome on the red version. This is a very small grip that I’m sure a lot of people would enjoy, however, this is not my thing. Another downside is the price. 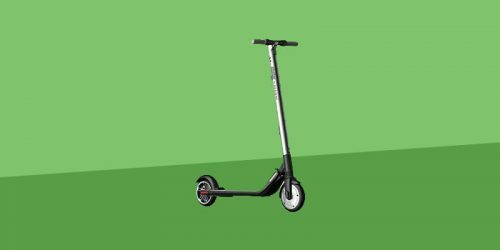 It’s quite a lot money, but for that you do get a very well designed and built scooter that performs flawlessly and will last through pretty much anything you throw at it. Overall, the Lucky Covenant is a great scooter that riders of any experience will be able to enjoy. It’s built well and can take a beating whilst also having some of the best looking decks available. 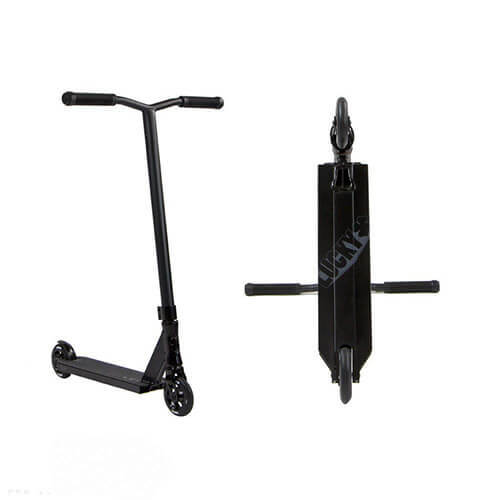 We’d highly recommend this to anyone look for one of the best stunt scooters on the market today and this is just about our favourite of all of the Lucky Pro Scooters. Coming in just behind the Covenant on our list of favourites is the Lucky Crew. This is on the other end of the scale from the Lucky Covenant. 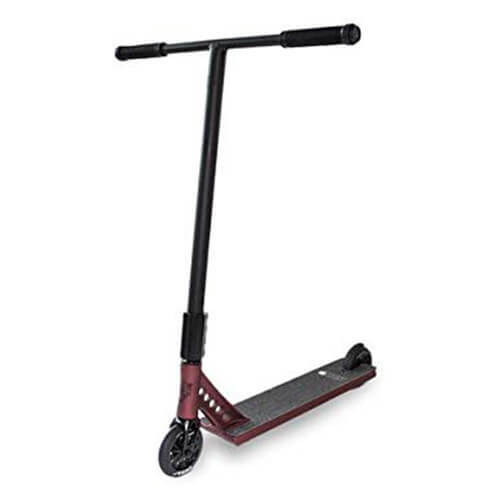 This is an entry level pro scooter that is ideal for beginners and younger children. 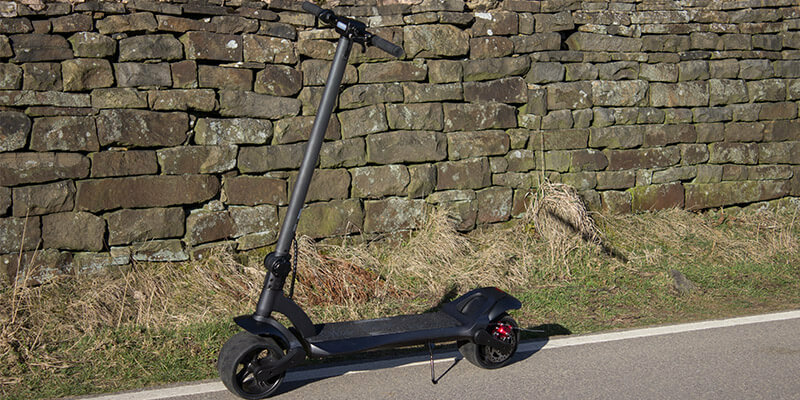 It is perfect for children up to and around 4.5ft in height and excels at helping to develop basic riding skills, jumps and simple tricks whilst still having the same excellent build quality and parts as other scooters from Lucky. For example, the Lucky Crew uses many of the same parts and materials as the Lucky Covenant, having the same aircraft grade aluminum as its main frame material. But the Crew is less than half the price of the Covenant, regularly coming in below $100. It also comes in a range of colors and styles, nothing quite like the premium artwork of the Covenant but having a choice is nice. 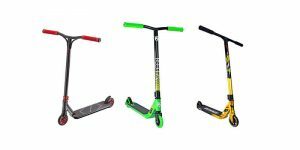 Overall, this is a great beginners pro scooter and it would be perfect for younger children who are just starting out and want a high quality and durable scooter to last them for a few years. The lightweight frame and materials makes it very easy to jump with and do basic tricks so learning should be about as easy as it comes with the Lucky Crew. It’s also well priced and offers great value for money. This helps cushion the blow just in case your children don’t stick at it or outgrow this scooter. The Lucky Evo is the ultimate performance trick scooter that Lucky offer. This is aimed at experts that are comfortable and experienced with intense shredding and the whole range of tricks. 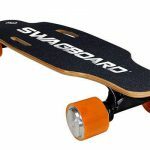 This is ideal for people who are over 5 foot and can be ridden by anything up to and over 6.5 foot. Lucky have included a series of small improvements over any of their other scooters with the evo. For example, the deck has been optimized to include increased foot space for stability and a higher chance of landing tricks and jumps. It also has a set of bars that Lucky call ‘hyper-durable’. These are a set of oversized Lucky ProBars that give you additional bar to grab when doing tricks. It also allows taller and larger riders to remain comfortable for longer. Whilst this scooter is aimed at the experts out there, it is just as good for any intermediate rider and above. What it does lack is any real creativity with the styling. It comes in three colors and doesn’t come anywhere near to the Covenant in terms of artwork. Overall, this is perfect for those of you who are wanting a practical, high performing and super durable trick scooter who don’t really care about the looks. Whilst the deck art is acceptable it does feel slightly generic. 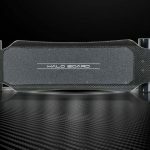 If this isn’t of a concern to you then you’ll be getting one of the best performing pro scooters on the market right now. The Lucky Prospect is a mid ranged pro scooter that is aimed at people that are thinking of taking their riding to the next level. If you’re a beginner who’s starting to think about a new scooter then this could be the perfect one for you. Likewise if you’re looking for high performance but don’t have the budget to go for the Evo or the Covenant then this is ideal. The Prospect stunt scooter stands out in performance and design from a lot of the similar priced competition. It features a concave top, flat sides and bottom, a flushed-out head tube designed to shred, and even has artwork artist Shogo Ota who does the fantastic Covenant artwork. For the Prospect there are a range of incredible deck artworks to choose from with different ranges from each year. What always surprises us is that even though this is generally considered a mid tier pro scooter the build quality is fantastic. It feels extremely solid with zero rattle or noise when riding but a slick, smooth operation. 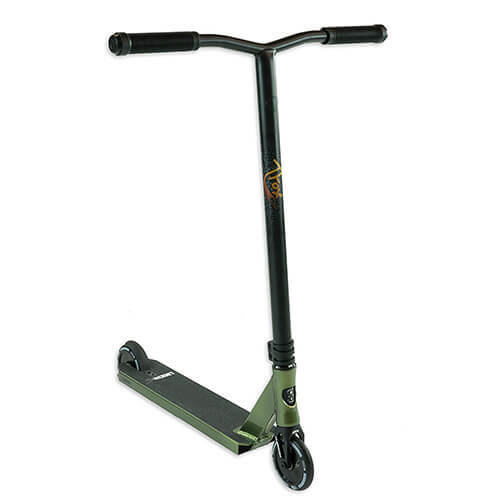 Overall, this is an excellent pro scooter that has proved to be one of the most popular that Lucky sell. It’s at the sweet spot of performance and price and we would probably recommend this to the majority of buyers. If you’re not sure which one to get, you probably won’t be disappointed with the Prospect. 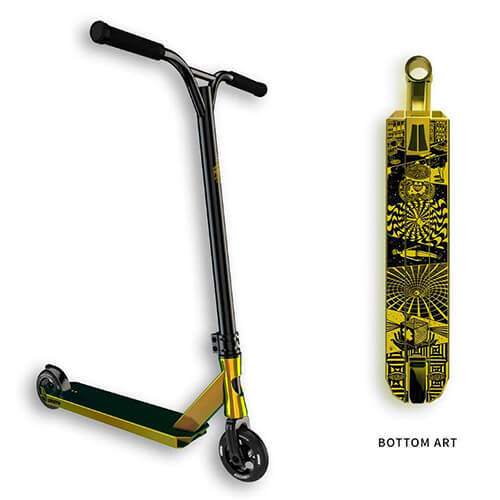 Lucky Pro Scooters have collaborated with Tanner Fox to bring to life a top of the line competition scooter that is available to anyone. They started with the popular Prospect deck and from there worked together to create brand new components that would help achieve the strength, speed and agility that the pros require. 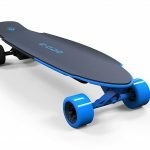 The result was the TFOX pro scooter lineup that comes in at a staggeringly light weight of just 7.9 lbs (3.58kg). Like the rest of the Lucky Pro Scooter lineup that we’ve mentioned today, the TFOX is built from the highest quality materials and can really take a beating. It’s also light enough to be able to very precisely perform basically any trick possible. The TFOX has a fairly simple design with a branded deck. We think this looks ok but we were hoping for something just a little more interesting. 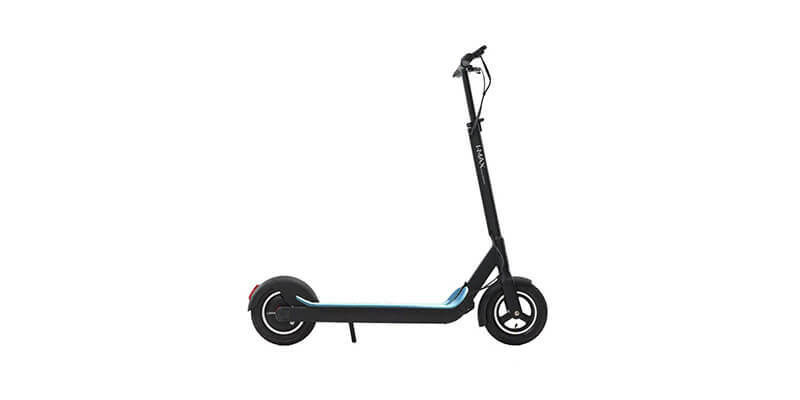 Overall, this is an interesting and unique scooter that still has the same quality and performance as anything else you’d expect from Lucky. Whislt the branding and style isn’t quite to our taste this could be the perfect present for someone that is a fan of Tanner Fox or is looking for a well priced, high quality pro scooter. We hope this has helped give you a solid understanding of some of the best Lucky Pro Scooters on the market right now. We recommend buying based on the experience of the rider, but if you want a solid all round scooter then the Prospect is a great all round buy.